Crooked Lane Books, 9781683314509, 336pp. Solving a murder way too close to home, Alison Kerby can't catch a break. If Alison Kerby really wanted peace and quiet, she never should have opened the Haunted Guesthouse. The Jersey Shore lodge's latest polter-guest is Richard Harrison, the recently murdered brother of long-time resident ghost PI Paul Harrison. Alas, a beyond-the-grave brotherly reunion is nowhere in the foreseeable future--phantasmal Paul left the guesthouse months ago for parts unknown, and for all her ghost-whispering prowess, Alison has no idea how to find him. And she's going to need Paul, because Richard's isn't the only murder still unsolved. Richard, a lawyer in life, tells Alison that he had been working the case of a woman accused of murdering her stepfather. When Richard got too close to the truth, he was permanently silenced. Now, as Alison searches for Paul, she gets a creeping sensation that the murderer doesn't appreciate her snooping around. If she doesn't succeed in her hunt, she has the feeling that she'll be the next to haunt the house. 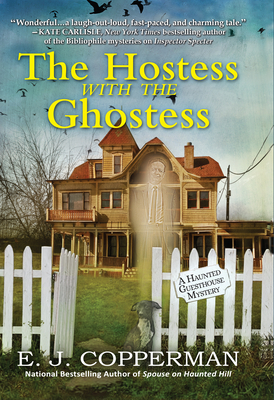 Raise your spirits with The Hostess With the Ghostess, the latest installment of Barry Award-winning author E. J. Copperman's national bestselling Haunted Guesthouse mysteries. E. J. Copperman is the author of a number of mystery series, including the Mysterious Detective series (Edited Out), the Haunted Guesthouse series (Spouse on Haunted Hill) and with Jeff Cohen, the Asperger's mystery series (The Question of the Felonious Friend). E. J. 's newest, the Agent to the Paws mystery series, began this year. It is exhausting for E. J. just to think about it.